My late husband was a great fan of William Faulkner. There are two shelves in his library devoted to Faulkner's works. Of course, I couldn't find what I was looking for and got distracted reading some of Faulkner's speeches and essays. There went an entire hour I was supposed to have spent cleaning house or writing a post for today. So, I had to resort to the Internet. I was looking for the words Faulkner either spoke or wrote about the inspiration for the title to his book Light in August. I had finished this novel on the plane coming back from Paris (this was long, long ago, before I ever met my husband). Sitting beside me were two French guys, maybe a little younger than I was, but they happened to be on their way to Oxford, Mississippi, on sort of as a pilgrimage, being Faulkner fans. I finished Light in August before we landed and gave it to them, even though my book was in English and theirs were in French. I also invited them to stop over at my parents' house near Atlanta, as they were working their way to Mississippi (this didn't go so well; my mother got sick changing the sheets because the fellows had not bathed for some time). I've gotten way off subject. Back to Faulkner's title. Every year it happens. I'll either strike out for the mailbox or look out the window, and I'll recognize that special light that only happens around the middle of August. It came this year this past Friday afternoon. I was sitting at the computer, and all of a sudden the sun came out, and there it was, the soft, luminous quality of light Faulkner spoke of - that "suddenly there's a foretaste of fall... It lasts for a day or two, then it's gone." The light is there again today. It's hard to explain, but it's something that can't occur in July or September or any other month. It usually comes with a bit of a cool down (and there is one, just not the hint of autumn that usually accompanies this fleeting light). When I went out to cut some sweet autumn clematis for a bouquet (the few pieces the deer couldn't reach; I had to get a ladder), I started thinking of all the white flowers you can have in an August garden. To name just a few: the invasive Clematis terniflora; of course, peegee type hydrangeas, the snow-white, fragrant blooms of Hosta plantaginea, acidanthera (used to have that; also fragrant) and rain lilies (if it ever rains enough). 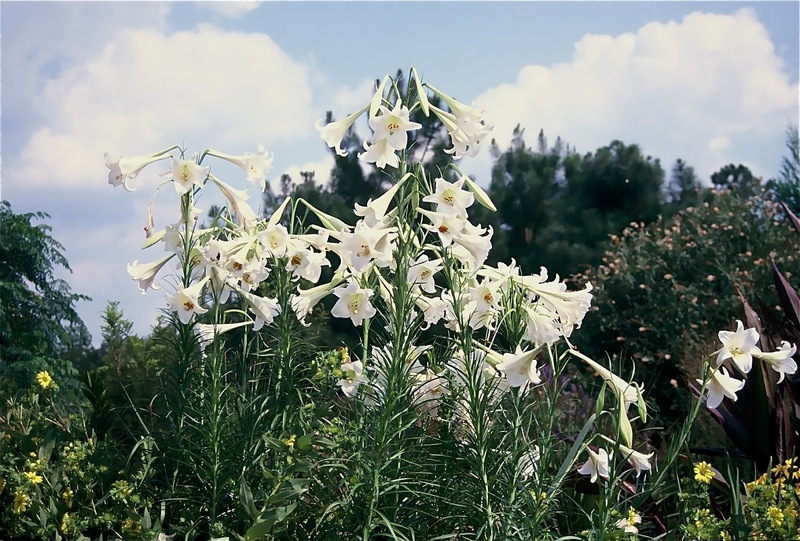 And, for the southeastern U.S. and other mild climates, you can have the above pictured Formosa lilies. Garden writer Tom Woodham's mother gave me some seeds once. I planted them, and lo and behold, in a couple of years, I had some super tall, fragrant lilies for a few Augusts in a row. Then the plants disappeared. At Tom's mother's house in South Carolina, the lilies would pop up all around the yard. She never knew where they'd be. Right now, I'm looking out the window (actually a glass door), and there's that special light, reflecting off a Japanese holly that's a pretty good look-alike for a boxwood. It's the way the sun settles softly on the leaves. It may be hot, but in that light is the promise of autumn. I bought triumphator lilies when Brent and Becky had their big sale. I planted them and then it was so dry I thought they would never bloom. Wonder of wonders, the 1st of August they were in full bloom. The scent has to be straight from heaven. I hope they come back next year but if they don't then I will try to purchase some more. I've got to have your lilies! This winter, I vow to get my deer fence. They finished up my Sum and Substance last night. I don't know how it had made it this far. But, I love lilies, and I want them, and somehow, some way, I'm going to get that fence. Good to know about Brent and Becky's sale. Am curious as to when it is.